Kent is a bit frustrated with the garden this year so far and those were his words when he saw that our organic broccoli and cabbage were eaten by…we don't know what. Whatever it was left no footprints. Keep in mind we have our garden inside two fences. 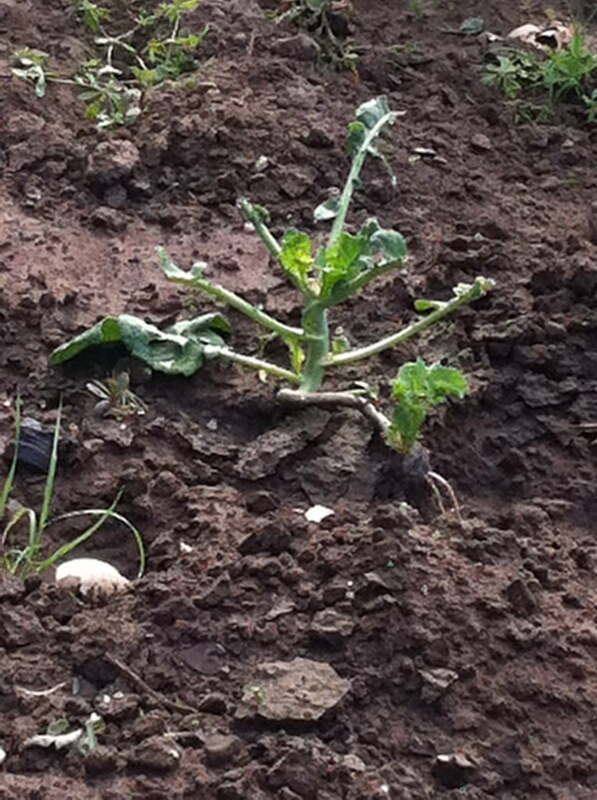 He also planted some melons out behind the fence and we're guessing the deer ate those. Well, it's nice that we're providing some nice organic produce for the wildlife this summer. At least our tomatoes and peppers are looking good! Let us know how your gardens are going so far this summer? The quest for nutrient-dense food: high brix farming: When I first read this article I was absolutely amazed at what I learned. I found it even more wild that all this DID interest me so much. A city girl eagerly learning about refractometers and soil quality? Trust me, it just might pull you in, too. From the damage, I would say it’s slugs or cabbage caterpillars. I had to deal with them this year. We got rid of them by simply picking them off and putting them in soapy water to drown. Our garden is doing great despite the bugs. As I said, we’ve dealt with cabbage caterpillars, along with potato beetles, white flies and aphids. The ladybugs took care of the aphids. The deer have come by a few times, however, the fencing that I have up keeps them out of the main vegetable garden. It has been a tough garden year where I am. We had EXTREMELY late frost along with a cool and wet spring. And by WET I mean water STANDING a few inches deep on TOP of the dirt! Now it is super hot (over 100 degrees for a week or two) and we are facing drought like conditions. We’ve gotten a few things . . .but a challenge for SURE . . . Ground hogs can be a challenge. As a child, my parents installed a low ELECTRIC fence around the garden. 🙂 That works for all except maybe deer. Also, sometimes you can play a radio out loud around the area. For bugs try soapy water w/ hot cayenne pepper added, diatomaceous earth, or Neem Oil. I think you can buy that at garden/home shops. It is completely organic. Today I will be googling ” how to keep squirrels out the garden”. I’m willing to do whatever it takes to get a decent harvest. I’m thinking we might have to enclose our raised beds somehow. Glad to hear your tomatoes are doing well. I think mine have failed, for the second year in a row. (Must be this dreadful Texas heat.) So needless to say I think next year I will use the space with something I have more luck with. My pickling cucs have done great both years so I will continue with them, along with my herbs, pole beans, summer squash etc. Not sure if I will do peppers again, they did awesome last year, but this year it seems as soon they really started thriving something came along and ate them. We’ve had to battle with rabbits and other creatures this time around — even putting up a fence around the garden to keep them out. It is very frustrating! You try so hard to take care this garden so that it will provide your family with good nourishing food. I’m not sure who is more exasperated, me (who does most of the gardening) or my husband (who sees me work so hard only to get frustrated with it). We will definitely be rethinking our garden for next year. my garden is doing great. we have been consistently harvesting stuff every day. i am replanting things as space becomes available. hope to be getting veggies till october. did find a rabbit trying to make a burrow under some lettuce…..almost had rabbit stew that day. i think i scared it enough as it hasn’t come back. sounds like you need to harvest some deer. that is some quality meat there. Chris and I are saying the same thing…. My hat is off to the organic farmer who deals with this on acres and acres of land. My worst nightmare! acck!!! Color me happy. Tomorrow, I’ll stomp off to the farmers market and buy my lettuce and supplies for the week. We moved out into the country last Sept. and in the summer the area is overrun with grasshoppers. We lost all our different types of lettuces. Next year we’ll be keeping the garden tidy and trying our hand at homemade sprays (cayenne pepper & dishsoap). I have chard in my garden and mine looks just like your picture, except worse!! The other night when I went to water my plants, I saw about 10 tiny green worms all over one plant. They were eatting it like crazy, until I picked them off and disposed of them. I bet that is what is eatting yours, especially if you find no signs of footprints and have a fence around your garden. Does anyone have a solution for those worms?? Try diatomaceous earth, food grade, not the pool filter stuff. Sprinkle it on the plants. Ah yes……I completly understand. It most likely is a groundhog. They maybe cute, but they are very distructive!!!! They can climb any kind of fence, and I mean anykind, and tree. And they dig. The only way to stop them is to kill them. They have been destroying my garden for a few years and every year we have to get rid of them. Then the garden will be alright for the rest of the season, what is left of it, or if caught in time can be brought back. I really makes me made when it happens, so I understand Kent. Every year is so different in the NW! Not enough sun this year, so the spring crops are doing great but the summer ones are very slow. And then of course there are the squirrels, birds, and cats that visit to dig and eat. One day I watched 2 doves land in my garden and start pecking at the dirt where I had just planted! Need to make better use of those garden covers next year – I used them once and they work great. Yes, gardening continues to be a challenge. It’s always something. My tomatoes are coming along. Tons of cherry tomatoes. Last year my tomatoes did horribly. They all had lines around the middle. I think the extreme heat & not getting enough water did it. I’m trying to keep on top of it this year. I got loads of squash, but the zucchini plant looks about done. I tried beets for the first time. They never got very big, but the greens were good. Still trying to get my herbs there. The dill is coming along, but I don’t know if my cilantro will do anything. It’s too small to do anything with right now. And I tried to get an early start on it. I tried parsley from seeds and that was a big disappointment! We have a fence around ours, too, but I saw BIRDS eating the leaves off of our melon starts a few days after we planted. So maybe crazy birds are eating your veggies??? Either way, it is frustrating, huh? That’s too bad about your plants:(!! Some kind of bug or beetle, maybe? I was going to say woodchucks, but if you have fences, I don’t know how that would be possible. We have a tiny 6 x 6 garden spot in our back yard. Our tomato (cherry) and cucumber plants are doing well–we also have sugar snap peas which we really enjoy. I’ve got two hanging baskets with basil and flat-leaved parsley that are also beginning to flourish. We tried planting earlier this year–radishes, lettuce, and carrots (all in the same plot as the above). Nothing turned out. The radish greenery grew really tall, but the radish roots didn’t develop. Out of a row of lettuce and carrots, only two seeds actually came up, and these were seeds I purchased last fall. We have ever-bearing strawberry plants that seem to produce one berry each all summer long. The birds seems to be enjoying those! The adventures of gardening! We get excited about anything that actually comes up and matures! 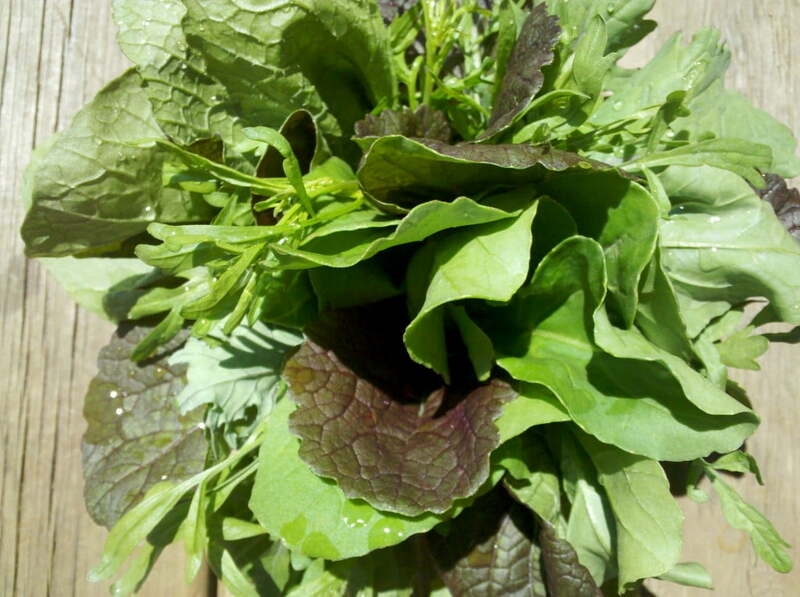 The deer and bunnies have been enjoying the “salad bar” growing in our yard too. I just hung bars of Irish Spring soap in mesh bags and I’m hoping this will deter them from my garden. The soap has worked perfectly to keep the deer away from dogwood tree we planted 18 months ago.